A U.N. Migration Pact Is Dividing Europe — And Has Become Fodder For Nationalists The pact, set to be approved this week, is meant to help the European Union navigate its most politically sensitive issue. The pact is non-binding, but several countries have pulled support. In this Sept. 1, 2015, file photo, a child waits in line at a migrant reception center in Brussels. Belgian migration minister Theo Francken said on Thursday he wants no part of a United Nations pact on safe and orderly migration, an international deal that has pushed Belgium's government to the brink of collapse. The men and women from eight African countries packed into a rubber raft late last month and set off from the Libyan city of Sabratha in the hope of crossing the Mediterranean to reach Italy. But powerful sea winds blew them off course. They drifted at sea for 10 days before their boat ended up back in Libyan waters and capsized off the coast of Misrata. At least 12 died. Libyan authorities managed to rescue 10. Othman Belbeisi, the International Organization for Migration's Libya chief, lamented the news on Twitter. "This is not acceptable," he added in a statement. "Saving lives at sea should be the No. 1 priority." This year, 3,381 migrants have died around the globe, according to the IOM. Since 2015, that number is 22,459. How to save migrants' lives, while also addressing calls for border controls, has drawn world leaders to Marrakesh, Morocco, this week to discuss the United Nations' Global Compact for Safe, Orderly and Regular Migration. The 34-page document, set to be approved Monday and Tuesday, offers guidelines on how to make migration more orderly and humane. It suggests cross-national cooperation, treating migrants with dignity, eliminating discrimination and even holding culinary festivals "to facilitate appreciation for migrant cultures." None of it is binding. The Trump administration refused a year ago to endorse the pact. A State Department official told NPR that it was "inconsistent with U.S. law and policy." The pact has split the European Union, where migration remains a politically toxic issue, even as the number of migrants arriving to the EU has dropped by 90 percent since 2015. At least seven countries — led by Hungarian President Viktor Orban, the leader of the EU's anti-immigrant nationalists — have refused to sign onto the pact. EU Migration Commissioner Dimitris Avramopoulos has urged those countries to reconsider. "It is in the interest of Europe and all countries directly or indirectly involved in migration," he told reporters in Brussels. The pact has brought the Belgium's government to the brink of collapse and forced Dutch leaders to publicly explain their support. Though Denmark has not withdrawn from the pact, its immigration minister Inger Støjberg is skipping the summit. She recently announced plans to ship migrants rejected for asylum to an uninhabited island in the Baltic Sea, where contagious diseases are studied. The pact, while a lightning rod, is not the central issue, says Gerald Knaus, an Austrian migration policy specialist who leads the European Stability Initiative, a think tank in Berlin. "The U.N. pact will really not change much in Europe for good or bad," he says. "What it has revealed is the success of the far right in Europe to take almost any document, and spin it to create the myth of a conspiracy of global elites who want to have a mass invasion of Europe." Last week, Marcel de Graaff, a far-right politician who believes migrants are invading Europe, claimed falsely that the U.N. migration pact would make criticism of migration a "criminal offense." De Graaff is a Dutch member of the European Parliament from the Party for Freedom, which cooperates with Geert Wilders, the Netherlands' best-known nationalist, who has called migrants "scum." The U.N. pact is "declaring migration as a human right," de Graaff told reporters. "So it will be impossible to criticize 'welcome migrants' politics without being at risk to be jailed for hate speech." Knaus calls that statement "completely delusional." "This is a non-binding pact!" he exclaims. "It's a campaign of lies, and the people who do it know it. But the fact that they are effective shows us that the mythology of a great conspiracy, which is spread in social media by far-right organizations very effectively, is becoming increasingly important in European politics." Consider Italy, where the leader of the anti-immigrant League party, Matteo Salvini, is now deputy prime minister and interior minister. He has vilified private humanitarian vessels that have rescued migrants at sea, calling them a "taxi service" and accusing them of working with smugglers in Libya. He refused to let them dock in Italian ports. Most gave up. The last charity ship operating in the central Mediterranean announced on Friday that it would cease operations. Salvini won parliamentary support late last month for a decree that abolishes humanitarian protection for migrants ineligible for refugee status who cannot be sent home. 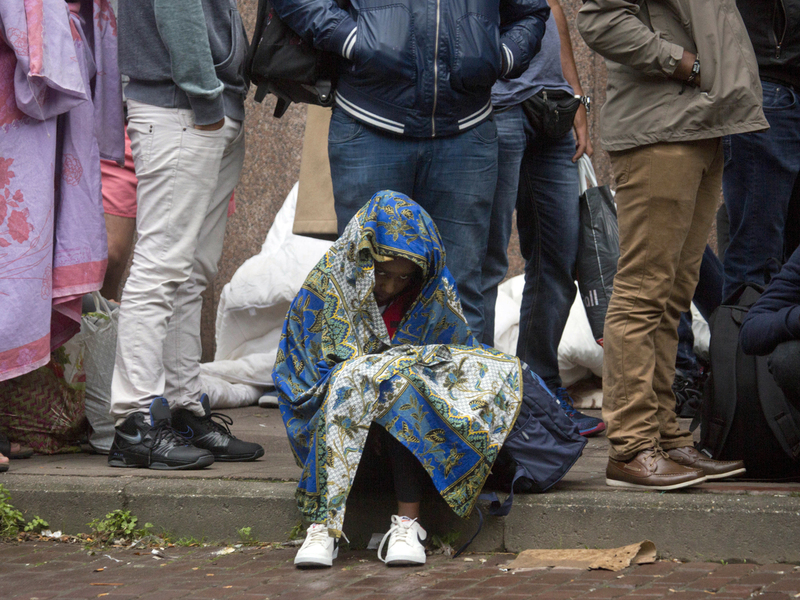 The decree could expel hundreds from migrant centers, leaving them homeless and "at risk of being exploited by criminal networks," says Matteo Villa, a migration specialist at the Italian Institute for International Political Studies. "And yet, an unintended consequence is that these migrants — tens of thousands of them — will be stuck in Italy." Migration has become such a fraught issue that "it's hard to make any rational arguments for it anymore," Villa says. "There is a detachment from reality." Villa points to a recent survey by Ipsos Italia, in which 60 percent of Italians said they believe that the number of undocumented migrants in Italy had increased since last year. "In reality," Villa says, "it dropped by more than 80 percent." The number of undocumented migrants in the EU fell after 2015, when centrist politicians led a crackdown. Yet they received little credit for the drop and the far right is still gaining. Centrists also face criticism from far-left activists who want open borders, says Anne Hammerstad, a migration specialist at Agulhas, an international research consultancy based in the U.K.
"Those centrists need to come onstage and not be afraid to discuss the positive aspects of migration as well as the challenges, because there are challenges," she says. That didn't work for the EU's most powerful centrist, German Chancellor Angela Merkel. She became the target of European nationalists — and President Trump — after Germany welcomed hundreds of thousands of asylum seekers in 2015. "We can do it," she told Germans, referring to integration of those refugees, most of whom came from Syria. But the far-right Alternative for Germany exploited the issue and is now the biggest opposition party in Germany's parliament. Knaus, the Austrian policy analyst, helped the EU draft a 2016 deal with Turkey that drastically cut irregular migration by sea to Greece. Human rights groups assailed the agreement, which, Knaus points out, "is based on existing human rights law." "This was extremely strategically blind," he says. He predicts this U.N. pact won't be the only target for Europe's nationalists. "They will attack all international human rights treaties," he warns. "This is not about what it is written in the pact or what it will actually do. It is about feeding a narrative, which is based on lies, on distortions, but which has been astonishingly effective." Europe's centrist leaders "need to wake up," he says. "And the human rights groups need to wake up. What is at stake here isn't this or that policy." What is at stake, he says, is much more. NPR's diplomatic correspondent Michele Kelemen contributed to this story.